then Farley Bud gets his turn! 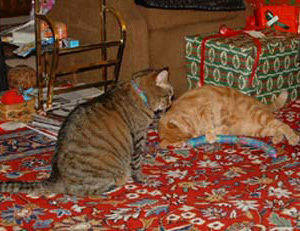 My neighbor's niece sent his cats some of your Hot Cats catnip toys as a gift. He lives across the hall from me -- and now I can't keep my cats out of his apartment since the toys arrived! 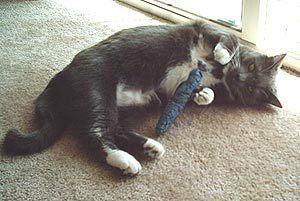 My cat, Willis Gray (above) has never had much of a reaction to catnip, but then a friend gave me your Hot Cats catnip toy. He was sleeping on his favorite chair and I set it next to him. The package wasn't even open yet but he actually woke up with his nose sniffing like crazy. He went right to it and started trying to rip it open. I grabbed my camera and have attached the cute photo. It is now his favorite thing in the world. Leave it to Oregon to grow such potent "herbs". Willis and I say THANKS for the good stuff! 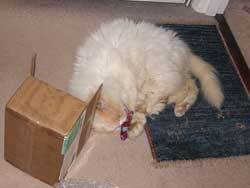 Sinbad loves his Hot Cat toy - and the box it came in. 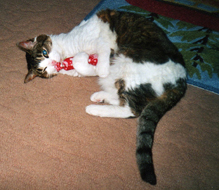 He received a Hot Cat toy for Christmas even though he lives all the way across the pond in Devonshire, England! 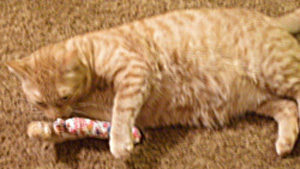 Freddy, of Corvallis Oregon - opening his Christmas Hot Cat toy. 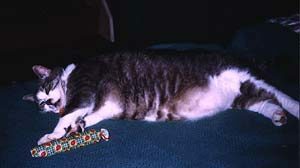 Also, he saw his picture in the Hot Cat tales from a few years before! 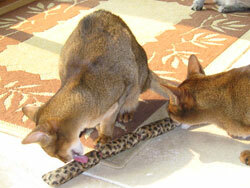 Abyssinian siblings Joey and Toesie enjoying their Hot Cats Deluxe. As you can see, they usually share quite nicely! 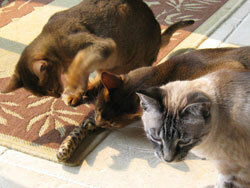 Maddie (the white one), and Joey and Toesie, our two Abyssinian siblings. They are having a ball with their new toy; the fighting has been minimal! and our cats have requested that we fill our home with more. All six of our cats get fresh Hotcats for Christmas. Here are Linkles and Maximus, celebrating. 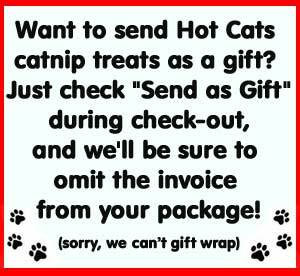 Hot Cats premium organic catnip is so strong, even the enclosed paperwork can become irresistible! 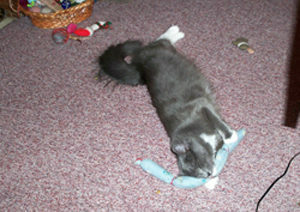 Emma.... still playing with her Deluxe Hot Cats toy! 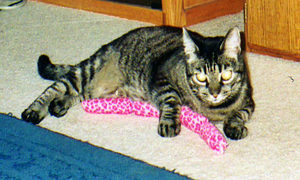 16 year old LaMew turns into a kitten with her Hot Cat Links! Meet Koshka, my 5-year-old calico. 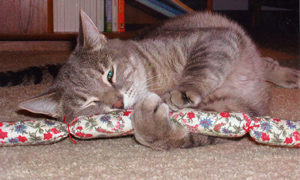 She has a catnip problem, ever since she was a kitten and got her cardboard scratcher with the little bag of catnip inside. 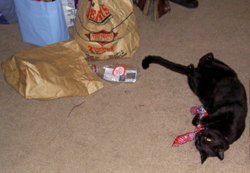 Even putting the catnip inside multiple plastic bags didn't keep her out of it (see the attached Catnip Frenzy). I discovered Hot Cats when a coworker went on a trip to San Antonio and brought back a box for my "children." Naturally, when I made my own trip to San Antonio I picked up a fresh box. Now, when anyone in the office goes to San Antonio they have to pick up a box of Hot Cats for me. It's a rule. Koshka always claims the entire box first, no matter where I put the box. 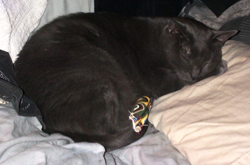 She rubs her head over all the "cigars" in it (I call 'em catnip cigars because she gets stoned on them) and holds one rubbing it all over her cheeks. But she still claims all the Hot Cats for herself. 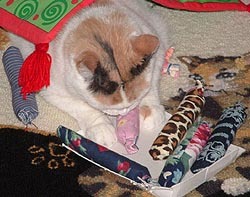 Her brother Odin got to lick the ones in the last box I brought home, and little Panda Bear is allowed to play with the empty cardboard box, but the cigars all belong to Miss Koshka, and Miss Koshka alone. So thank you so much for the wonderful Hot Cats! 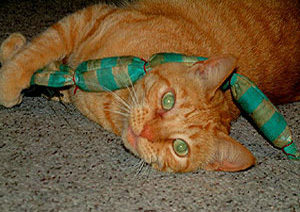 Zack loves to play for hours with his Deluxe Hot Cat toy! 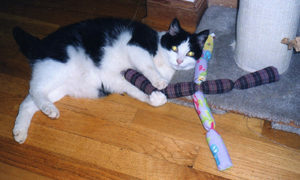 My cat, Quasar, loves her new toy! She drools all over it and licks her toy and if you try to take it from her, she picks it up in her mouth and runs to another room! Thanks for helping me to spoil my little girl! 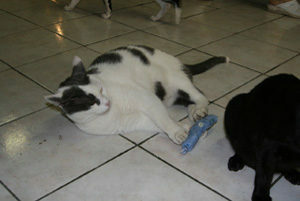 Cats in a shelter in Rome, Italy are thrilled and happy. Why? Today they received some unexpected gifts! 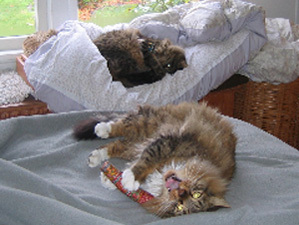 A supporter from the United States sent them some irresistible new Hot Cats catnip toys. 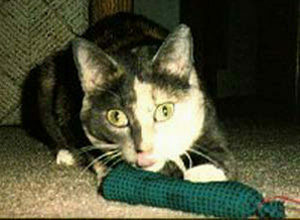 Stormy went CRAZY over her Hot Cat toy, the one thing she would consistently chase around the apt until it slid under thew radiator. Great to see the psycho come out in a normally sedate feline...I'm ordering the Deluxe version as a special treat. Thanks for making such a GREAT product! We love your products. Our boy, Sneezy, especially Loves 'em! Sent 2 photos that show his Delight. Thanks so much for the great quality of your products. 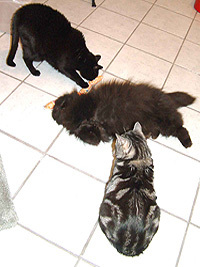 It is Christmas, and today my kitties (4 of them) got one of your larger HotCats (Deluxe) "sausages" to share. 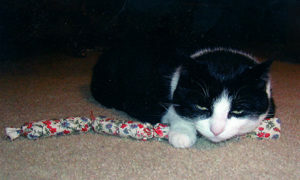 After giving it to the alpha, I gave it to Louie, who is by far my most timid kitty. 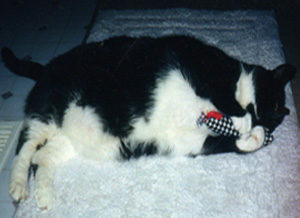 Give him some catnip though, and for wonderful moments, he forgets that he is so scared of humans. 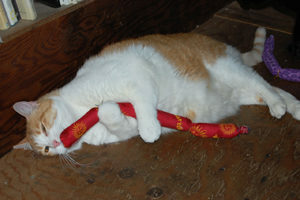 Attached are a couple of pictures I took of him today - getting blissed out with his HotCats. 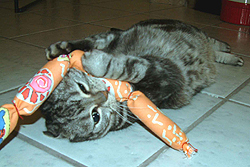 Here's Tab again, still playing with his sturdy Hot Cats toy! 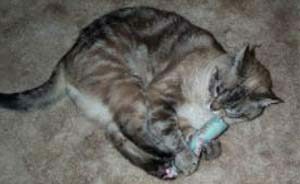 Abby, who lives in Tigard, Oregon, loves to steal Cosmo and Chloe's cat toys! 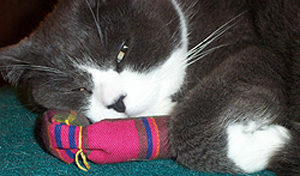 Mohawk blissfully snuggles with his most favorite cat toy! 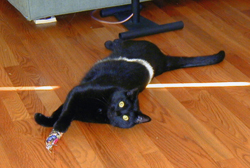 "They (Hotcats) are wonderful - my guys even turn over the wastebasket to get out the wrapper!" 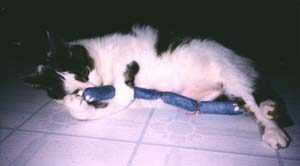 a friend of mine gave me a Hot Cat "sausage" for my cat, and Mr Phat never thought catnip was cool enough for him -- until now. He's goin' nuts over it!!! 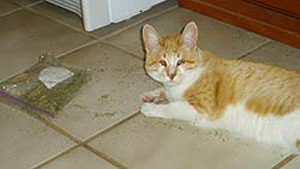 Holy Catnip! Our Mom & Dad said they were going to bring a present, so we thought "oh no, another stupid cat toy we have to pretend to like". But when Mom gave us this, it was great - we had the best time ever! 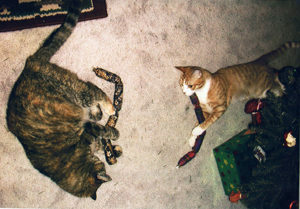 In fact, Mom made us put our Hot Cat toy away in the middle of the night because we kept her up playing. Oh well, there's always tomorrow morning! -Nova, Taylor, Becky, and Q -RonkonKoma, N.Y. 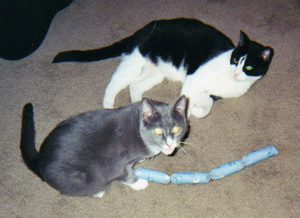 I've been giving my kitties your Hot Cats links ever since I discovered them in Eugene, OR when I was a student there (about 8 years ago). THEY ARE FANTASTIC! 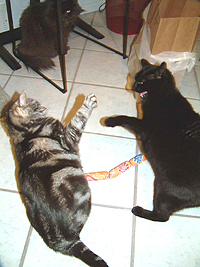 I've never seen any cat go as nuts for a treat as my cats do when they get one of your links. It's unbelievable! I just wanted to thank you on behalf of my kitties (as well as my family's kitties): Zazu, Nikko, Dante, Stella, Pablo, and Pennzoil. THANK YOU! 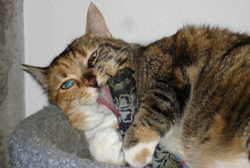 Martha is age 17 & blind - and still loves her Hot Cat! 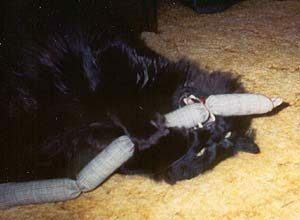 Sable gets a turn to play! Rose, Portland Ore. - corners the market for Hot Cats in her house. 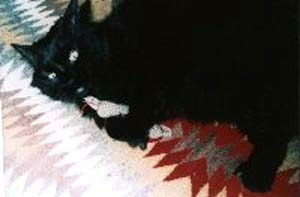 Nightfall, from Vancouver, Wash., gets that wild look in his eyes! The best toy/Gift I have ever found. My 3 cats heartily second that statement and anxiously await the new ones. 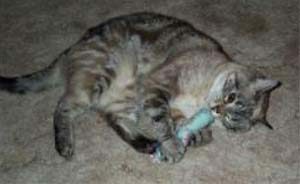 Their old (Hot Cats) are over a year old, (Loved to death and still preferred over newer inferior catnip products). 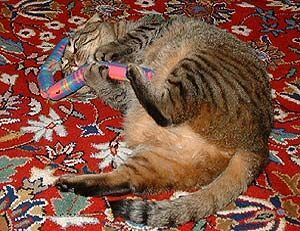 These are the best, longest lasting, catnip bags I have ever found. My cat destroyed all the others in no time. These are tough and rugged. 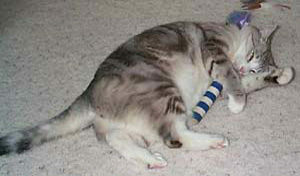 And the catnip is really strong primo stuff! 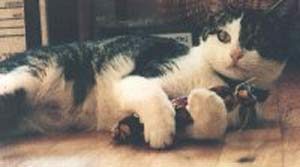 "I should have listened to the woman in the store and bought two - my cats are fighting over the one I brought home!" Thanks for making such a great toy! Everything else is just second best. PS) I love to lick and roll on top of my Hot Cat. 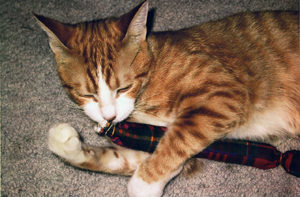 McDuff got a Hot Cat with the family tartan! I just wanted to write to tell you that my hot links keep getting stolen by neighborhood cats who sneak in and steal them - often I will find them in the garden or driveway! 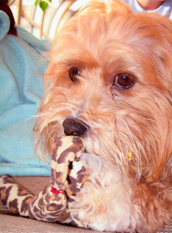 Your toys are wonderful and the favorite of any I have ever bought.. Keep up the good work! 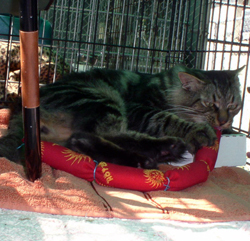 Dusty, enjoying his toy in his outside condo at a shelter in Charleston, Rhode Island - he also has another to keep him amused at night, and there's another in his "going home' bag. They have now learned how to open the door to my home office, (where I store the Hot Cats toys) just to run and pounce on their favorite toys! 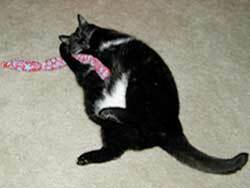 We were thrilled to see Fat Cat in Pics & Purrs when we opened our latest Hot Cat! 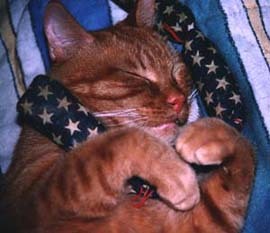 Fat went to cat heaven in July, but we have just adopted Howard-an orange shorthair - who is carrying on the Hot Cat tradition... Thanks from Fat Cat's family. 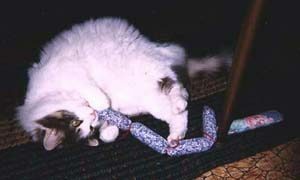 Martha & Ron Norwalk, Conn.
Just brought home a "Hot Cat" toy we purchased in Sausalito, California. Our boy Neezy went absolutely delirious! He DID smell it through your packaging and the store's bag; plus, it was up on our bed. He jumped on the bed and started slapping the bag. I opened your packaging and Neezy knocked it out of my hand and jumped on it like it was a gopher! 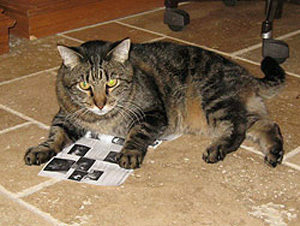 He then began to act like many of the cats pictured in your brochure. Our 7 yr old hunter-cat played like a kitten. Great product! My Name is Quiche' . 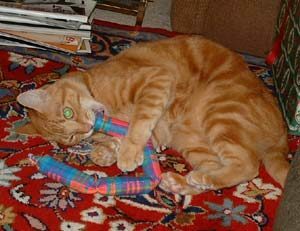 I am 10 years old and I found Nirvana the day my Human brought home my first Hot Cats.My human is ever so pleased at how I tend at times to lose control -- but no matter how much I lick, chew, toss, kick, and generally abuse this wonderful toy -- I am unable to destroy it. 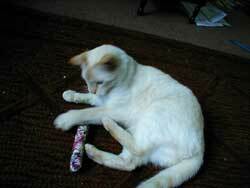 So, from the bottom of my soft little pink paw pads, I want to thank you for this wonderful gourmet catnip treat. 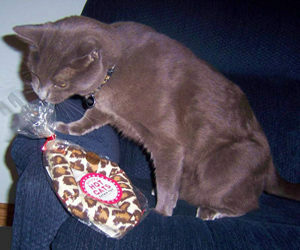 - my cat Lil' Guy had already found the bag with the new Hot Cats sausages, managed to pull one out of the double paper bagged wrapping - chewed/tore open the package and is already "nipping out!" Only the best quality will do for our "pride and joy", Stevie Ray. 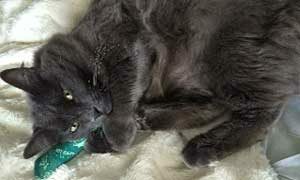 And he loves his Hot Cats catnip treats. 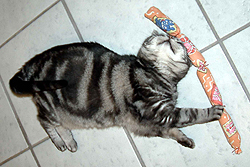 Here he is, blissed out in cat heaven!